PHOENIX, Arizona, July 24. 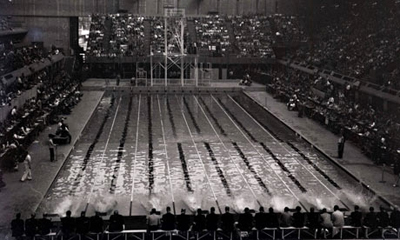 IN today's installment looking at previous venues for swimming at the Olympic Games, we look at the history of the pools hosting the 1932, 1948, 1952 and 1956 editions. 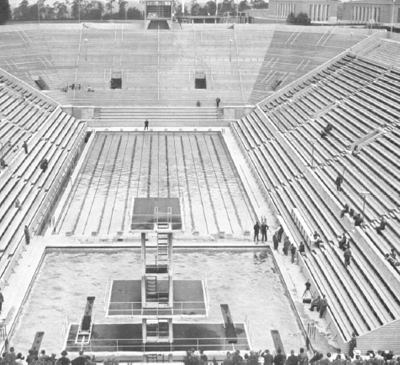 The first part of this series examined the early pools built for the Olympics, starting in 1908 in London and continuing through to the 1932 Games in Los Angeles. Those Games, the second time the Olympics were held in the United States, marked the beginning of a trend of keeping the existing venues intact for future use. Pools also were getting deeper. 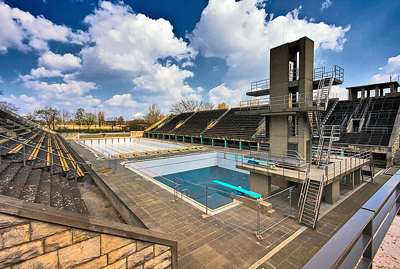 At the 1936 Olympics in Berlin, Germany, the main competition pool varied in depth from 2 meters (6.5 feet) to 2.3 meters (7.5 feet). Records indicate the water temperature was a very chilly 68 degrees Fahrenheit (in line with FINA's guidelines), with the water constantly pumped in from a plant miles away. 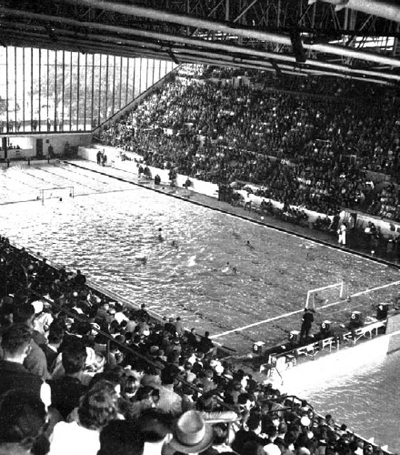 The pool still exists in Berlin, and not much has changed in 76 years. The aftermath of World War II had an effect on the venues used for the 1948 Games. No new buildings were constructed, as the country was still rebuilding from the war. 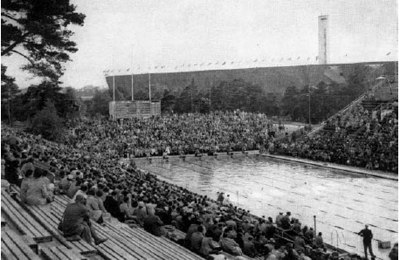 Swimming events were held at the Empire Pool, which was the site of the 1934 Empire Games, the name previously given to what is now known as the Commonwealth Games. The pool was never meant to be a permanent or main fixture in the Empire Pool and Sports Arena. Designer Arthur Elvin designed the facility to host numerous sporting events, as well as non-sport acts. The Empire Pool was also the first indoor Olympic pool, almost a necessity in the unsure climate of London in the summer. 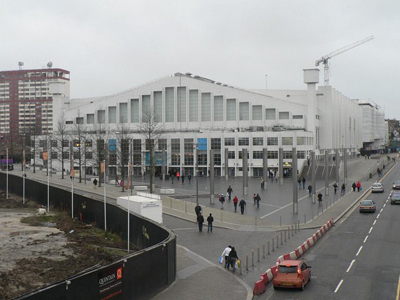 The pool no longer exists, but the building that housed it has become one of the most famous entertainment venues in the United Kingdom: Wembley Arena. The venue now hosts a variety of events, including music concerts featuring some of history's most famous acts. At the 2012 Olympics, badminton and rhythmic gymnastics events will be staged in Wembley Arena. Not many pools in the world have as interesting story to tell as the one used for the 1952 Games. Helsinki had been awarded the Olympic Games for 1940, but World War II canceled those Olympics. With an empty tank not in use, Finland decided to use the pool to store herring and root vegetables to send to troops. Equipment to heat the pool to the then-required 71 degrees Fahrenheit also was affected by the war. 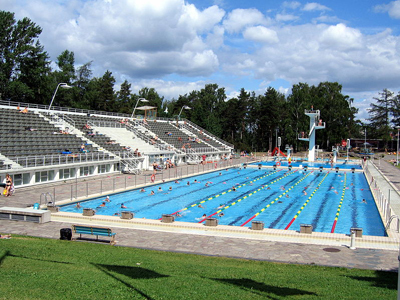 The heating system that was to be used for the pool was damaged in transport during the war years, and a new system was rushed to Helsinki in time to keep the water at 75 degrees Fahrenheit, a relatively warm temperature considering the air temperature hovered around 68 degrees in the daytime. As you can see in the above photo, spectators were closer than ever to the competition, sitting mere feet from the pool's edge. Today, the pool has had very few upgrades, though a multipurpose gym and additional wading pools have been constructed since 1952. The pool is now a recreational hub in the summer months, and since it is outdoors, too cold for use any other time of the year. It should come as no surprise that Australia went all-out in constructing a sparkling new swimming venue, as the country has always embraced swimming as one of their natural sports. However, an interesting aspect of the pool was its depth. The starting end measured 6.5 feet, but the depth of the turning end was only 3.5 feet. So much has happened to the facility that housed the swimming events at the 1956 Olympics. 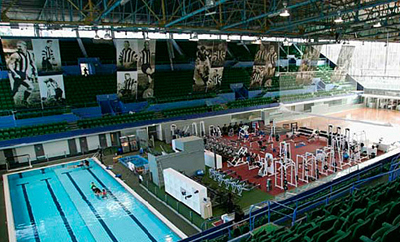 After Dawn Fraser and others claimed Olympic glory, the pool and many venues around it were re-purposed for sport and entertainment events. The facility still houses a pool, one that's about 25 meters long. Interestingly, the seating used in 1956 appears intact on either side of a fitness center that lies on top of the place where the competition pool existed. A stone's throw from the site of the swimming events of the 1956 Olympics is the Rod Laver Arena, where the 2007 FINA world championships took place. Up next: A look at pools in Rome, Tokyo, Mexico City, Munich and Montreal.